This is the real and personal story behind the Queen phenomenon: One of the most extraordinary chapters in rock and roll history, now indelibly printed in the minds of millions throughout the world. It's a story beginning 25 years ago when John Deacon, Brian May, Freddie Mercury and Roger Taylor played together for the first time. Suddenly rock was no longer the same. Under Queen it became bigger, brasher, more extravagant and unashamedly more entertainment than ever before. 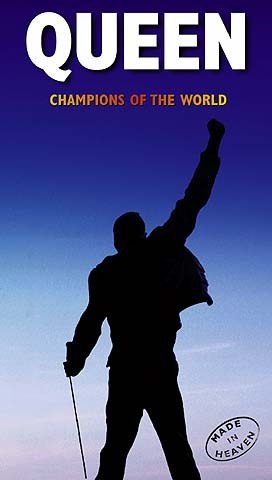 Queen set the the milestones and landmarks for two generations: 'Bohemian Rhapsody', 'We Will Rock You', 'We Are The Champions', Rock In Rio, Live Aid, the Magic Tour. The Music, the concerts, the videos. The unforgettable moments. Queen have released 20 albums, sold more than 130 millions records, and influenced legions of todays major artists, many of whom were there for the final tribute to Freddie at Wembley Stadium in April 1992. 'Champions Of The World' is also a private look at the world of Queen, the lives and times of four people, John, Brian, Freddie and Roger, who provided each other with the inspiration and purposethat was the magic behind the phenomenon.